Happy Hobbit Day, My Friends! It's two very special birthdays today! 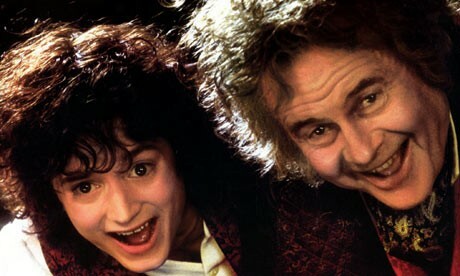 Happy Birthday to the Baggins Boys - Frodo and Bilbo!! I would like to take a minute to thank both Frodo & Bilbo, as well as Professor Tolkien, for opening my life up the way they did. I fell into fandom when I discovered ER fanfic online, so yeah, maybe I would have gotten this into fandom through other avenues, but I can't imagine it would have been such a welcoming open environment as I found in the LOTR fandom. So I guess this is also a 'thank you' to the LOTR fandom, for being my first fandom-family. Today is a celebration of all of you out there who have dipped a toe or burst your way through the fandom door. And a celebration of green rolling hills and muddy dirt roads and glittering caves and snowy mountain tops and rushing waterfalls and every road Tolkien took us down. I didn't keep my feet, Professor, and I am glad of it. What a lovely post. We're a lucky bunch o' gals, and no mistke. Tolkien and his buddy Lewis started my love of fantasy SO EARLY in my life - I hate to think what I might have missed without their early influence on my brain meats! Oh yes, CS Lewis. It was Narnia that started everything for me. That started me laying in bed at night, thinking of other worlds, of the possibilities that these places really truly existed. Narnia opened a door for me when I was very young. I would never have known what I was missing, but I am SO GLAD that I DO know! Love you, babe! Tolkien was for sure a genius. The hobbit and LotR are some of the best books ever written, hands down. They fed my love of fantasy and adventure when I was younger, heck, they still do. A very happy birthday to the hobbit boys! Tolkien was for sure a genius. The hobbit and LotR are some of the best books ever written, hands down. They fed my love of fantasy and adventure when I was younger, heck, they still do. It was definitely Narnia for me, that opened the door to the idea of other worlds, other possibilities. But that door led me to Middle Earth eventually and to fandom and onward and onward and onward, through the whole journey of my life. I wonder if these two great men- Lewis and Tolkien - knew they would forever affect the lives of the millions of people who laid their hands on these fantastical books, these wonderful worlds.